Carlsbad Caverns National Park is a United States National Park located in the southeastern corner of New Mexico near the city of Carlsbad, where the plains of the Chihuahuan Desert meet the Guadalupe Mountains. On October 25, 1923, President Calvin Coolidge proclaimed the Carlsbad Caverns a national monument. Status as a National Park was designated in 1930 and in 1995 it was proclaimed a UNESCO World Heritage site. Approximately two–thirds of the park has also been set aside as a wilderness area, helping to ensure no future changes will be made to the habitat. One of the largest underground chambers ever discovered lies within Carlsbad Cavern, which is a virtual labyrinth of chambers. Though the total length of rooms and passages is not known, the explored area of the main cavern is more than 30 miles long. Lechuguilla Cave, discovered in 1986, is the focus of much current cave exploration at the park. It has been mapped to a depth of 1,604 feet (489 meters), making it the deepest limestone cave in the U.S. 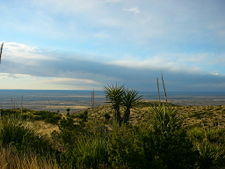 The park is located where the plains of the Chihuahuan Desert meet the Guadalupe Mountains and ranges in elevation from about 3,200 feet (1,000 m) to 5,500 feet (1,600 m). The primary natural entrance to the Big Cave is in a depression in a mesa on the side of Walnut Canyon, which contains the main entrance road to the park. Flora and fauna of Carlsbad are typical of the Chihuahuan Desert, with relatively few large animals and plant life that are adapted to the dry environment. Practically every plant species in the park has spines or thorns on it, and the prickly-pear cactus, ocotillo, and lechuguilla are widespread and difficult to hike through. Yucca, Texas black walnut, and desert willow dominate the surface area of the park. Wildlife within the park includes mule deer, coyotes, bobcats, and pumas (mountain lions). The caves themselves are the home of a distinctive fauna including cave crickets that have adapted to conditions of total darkness. Raccoons, ring-tailed cats, and skunks are often found around the cave entrances. Rattlesnakes are common in the area, particularly around the entrances to backcountry caves. By far the best-known park denizens, however, are the enormous colonies of Mexican free-tailed bats that live in the "Big Cave" and other caves. Sixteen species of bats live in the park, including a large number of Mexican Free-tailed Bats, named as such because the lower half of their tail is free of any membrane. They are a medium-sized bat with a body length of about 4 inches and a wingspan of just over 12 inches. Their fur is dark brown or gray. They form huge nursery colonies where they congregate to bear and raise their pups with about 90 percent of the newborns arriving within 15 days of each other. One pup is born each year between June and mid-July. Soon after the baby bats are born, their mothers leave them behind in the cave while they go out to hunt insects. The mother remembers where she left her "pup" by recognizing its unique "cry" and smell. The species is very important for the control of pest-insect populations. However, its populations are in an alarming decline because of pesticide poisoning and the destruction of their roosting caves. The population, estimated to contain 8.7 million in 1936, had fallen as low as 218,000 by 1973. The various techniques used to estimate the bat population point to a current population peak of several hundred thousand when the young pups are flying in the autumn. Bat flights occur in the evening during much of the year, beginning soon after sundown. 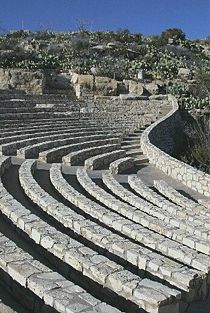 The emergence of the bats provide a spectacle for visitors, such that a small seating area/outdoor theater near the caves' natural entrance has been created. The climate in the park experiences cool dry winters with temperatures averaging a pleasant high of 60 degrees. Summers are very hot with brief but intense thunderstorms. Spring and fall tend to have agreeable temperatures and little precipitation. Inside the underground caves, it generally stays quite cool with a year-round average of 56 degrees, rarely deviating from that temperature. The caves lie primarily within a Permian limestone reef, created by an inland sea more than 250 million years ago. The fossils found here reveal the reef was built mostly of sponges and algae instead of the more common coral. An unusual feature of Carlsbad Caverns is that it is located atop a field of natural gas and oil. As a result, the usual calcium-carbonate cave formations are supplemented in some areas by formations based on calcium sulfate (gypsum) created by the migration of sulfur-bearing water up from the gas field. This combined with a tendency for the limestone containing the bulk of the caves to fracture along massive joints, results in the unusual combination of very large cave passages and extremely ornate or, in many cases, massive decorations. The calcium-sulfate formations tend to be delicate and are not usually visible to the casual visitor, but some of the backcountry caves have astonishing calcium-sulfate formations. Over 1,000 years ago Native Americans took shelter in the cavern leaving behind only mysterious drawings on the walls of the cave near the natural entrance. Later, in the 1800s, settlers of the west discovered the cavern and its thousands of bats, giving it the name "Bat Cave." A mining company entered the cave and extracted tons of the bat guano and sold it as a natural fertilizer. Shortly thereafter, a Carlsbad-area cowboy by the name of Jim White, with only a kerosene lantern, spent much of his time exploring the many rooms and gave them their names, including "Big Room," "New Mexico Room," "King's Palace," "Queen's Chamber, Papoose Room, and Green Lake Room. He also named many of the cave's more prominent formations, such as the Totem Pole," "Witch's Finger," "Giant Dome," "Bottomless Pit," "Fairyland," "Iceberg Rock," "Temple of the Sun," and "Rock of Ages." Although he reported incredible tales of this vast underground wilderness to many, it took some black and white photographs taken by Ray V. Davis, who accompanied White on one of his trips to the cave to convince others that White's tales were true. When the photographs were displayed in the town of Carlsbad in 1915, it became a huge sensation. With people clamoring to view the cave, White gave tours by lowering people down 170 feet in a bucket once used to haul bat guano from the cave. 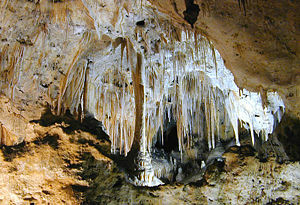 "I am wholly conscious of the feebleness of my efforts to convey in the deep conflicting emotions, the feeling of fear and awe, and the desire for an inspired understanding of the Devine Creator's work which presents to the human eye such a complex aggregate of natural wonders"
Later that year, Carlsbad Cavern was proclaimed a national monument. 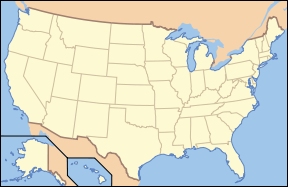 Carlsbad, the town, and, thus, Carlsbad Caverns National Park, supposedly take their name from Charles IV, Holy Roman Emperor of the Czech Republic, (Karlovy Vary), meaning literally, Charles' Baths, in German. The "Bottomless Pit" was originally thought to be bottomless. Stones were tossed into it, but no sound of them striking the bottom was heard. Later exploration revealed that the bottom was about 140 feet (43 meters) deep and covered with soft dirt, which had muffled the sound of the stones landing. In 1985, a very distinctive method of exploration was invented. In a dome area 250 feet above the "Big Room" floor not far from the Bottomless Pit a stalagmite leaned out. Using a balsa wood loop with helium-filled balloons attached, the explorers—after several tries over several years—floated a lightweight cord that snagged the target stalagmite. Once the lightweight cord was in position up, over, and back to the ground, a climbing rope was pulled into position, and the explorers ascended into what they named "The Spirit World." A similar, smaller room was found in the main entrance corridor, and was named "Balloon Ballroom" in honor of this technique. Lechuguilla Cave, another cave in the park discovered in 1986, is the focus of much current cave exploration at the park. It has been mapped to a depth of 1,604 feet (489 meters), making it the deepest limestone cave in the U.S. The entrance is located in an old mining pit known as "Misery Hole" in an obscure corner of the park. It is not accessible to the general public, and the exact location of Misery Hole is kept relatively secret in an attempt to preserve the cave in its most undisturbed state. In 1993, a series of small passages totaling nearly a mile in combined length was found in the ceiling of the "New Mexico Room." Named "Chocolate High," it was the largest discovery in the cave since the "Guadalupe Room" was found in 1966. The main attraction in the park is the "Big Cave" and its "Big Room," at one time considered the largest natural underground chamber in the world. Although no longer occupying that niche, it is still one of the world's largest cave rooms. Its unusually extensive and diverse decorations make it a prime tourist destination. The Big Cave is one of over 80 caves within the park, but it is neither the longest nor the deepest of the park's caves. Both of these honors fall to Lechuguilla Cave, a "wild" cave not normally open to tourists. Several of the accessible "wild caves" are in a detached region of the park containing "Slaughter Canyon," one of the typical, and typically rugged, canyons descending from the Guadalupes onto the plain. The Big Cave is an amazing underground world where limestone formations create an unusual kind of beauty. Inverted spires called stalactites reach downward like crystal chandeliers and stalagmites rise up from the cavern floor, where at times the two will meet and form extensive pillars. Access to this room requires a 750-foot elevator drop. There is a relatively level 1.25-mile trail around the perimeter of the "Big Room" passing famous features including "Bottomless Pit," "Giant Dome," "Rock of Ages," and "Painted Grotto." Outside the entrance to the caverns. 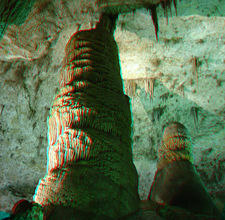 May be seen in 3D with glasses USGS 3D image. 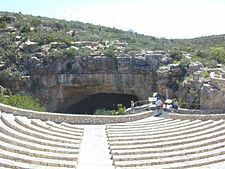 The natural entrance to Carlsbad Cavern lies just beyond the bat amphitheater. Balloon Ballroom - Located in the ceiling above the main entrance corridor, this small room was first accessed by tying a rope to a collection of helium-filled balloons and floating them into the passage. Bat Cave - A large, unadorned rocky passage connected to the main entrance corridor that was mined for bat guano in the early 20th century. The majority of the cave's bat population lives in this portion of the cave. Bell Cord Room - Named for a long, narrow stalactite coming through a hole in the ceiling, resembling the rope coming through a church steeple to ring the bell. This room is located at the end of the Left Hand Tunnel. Bifrost Room - Discovered in 1982, it is located in the ceiling above Lake of the Clouds. Its name refers to a Norse myth about a world in the sky that was accessed from Earth by a rainbow. The room was given this name because of its location above the Lake of the Clouds and its colorful oxide-stained formations. Big Room or The Hall of the Giants - The largest chamber in Carlsbad Caverns, with a floor space of 357,470 square feet (33,210 square meters). Chocolate High - A maze of small passages totaling nearly a mile in combined length, discovered in 1993 above a mud-filled pit in the New Mexico Room known as Chocolate Drop. Green Lake Room - The uppermost of the "Scenic Rooms," it is named for a deep, malachite-colored pool in the corner of the room. In the 1940s, when the military was testing the feasibility of Carlsbad Cavern as an emergency fallout shelter, the Green Lake was used to look for ripples caused by a nuclear bomb test many miles away. None appeared. Guadalupe Room - Discovered by a park ranger in 1966, this is the second largest room in Carlsbad Caverns. 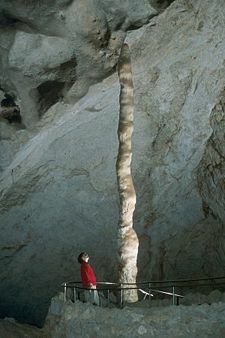 It is known for its dense collection of "soda straw" stalactites. Hall of the White Giant - A large chamber containing a large, white stalagmite. Rangers regularly lead special wild cave tours to this location. King's Palace - The first of four chambers in a wing known as the "Scenic Rooms," it is named for a large castle-like formation in the center of the room. The Bashful Elephant formation can be found here. Lake of the Clouds - The lowest known point in the cave. It is located in a side passage off the Left Hand Tunnel. It is named for its large lake containing globular, cloud-like rock formations that formed under water when the lake level was much higher. Left Hand Tunnel - A long, straight passage marked by deep fissures in the floor. These fissures are not known to lead anywhere. The Left Hand Tunnel leads to the Lake of the Clouds and the Bell Cord Room. Mystery Room - A small room located in Lower Cave. New Mexico Room - Located adjacent to the Queen's Chamber and accessed by means of a short slope. New Section - A section of fissures east of the White Giant formation and parallelling the Bat Cave. New discoveries are still being made in this section. Papoose Room - Located between the King's Palace and Queen's Chamber. Queen's Chamber - Widely regarded as the most beautiful and scenic area of the cave. Spirit World - Located in the ceiling of the Big Room, this area is filled with white stalagmites that resembled angels to the room's discoverers. Talcum Passage - A room located in Lower Cave where the floor is coated with gypsum dust. The Rookery - One of the larger rooms in Lower Cave. A large number of cave pearls are found in this area. Underground Lunchroom - Located in the Big Room at the head of the Left Hand Tunnel. It contains a cafeteria that was built in the 1950s, and is where the elevators from the visitor center exit into the cave. The park's policy toward access to caves in the backcountry varies from year to year. Most backcountry caves are closed completely to the public except on special occasions. However, Goat Cave, Ogle Cave, Corkscrew Cave, Christmas Tree Cave, Wen Cave, and Lake Cave have all been open to the unescorted recreational caver at various times. Most of these caves have significant vertical sections and are best left to only the most experienced rappellers. There are several surface trails in the park that afford the hiker a first-hand look at the ruggedness of the terrain. Several are in the Slaughter Canyon area. Birds in surprising abundance exist in the Rattlesnake Springs picnic area, which is in the detached area of the park. ↑ National Park Service. December 15, 2003. 18th Anniversary of Spirit World Exploration at Caverns, Retrieved June 20, 2007. WikiTravel. April 11, 2007. Carlsbad Caverns National Park. Retrieved June 23, 2007. MainTour. Tour Carlsbad Caverns National Park. Retrieved June 23, 2007. Uhler, John William. History of Carlsbad Cavern National Park. Carlsbad Caverns National Park. Retrieved June 23, 2007. Carlsbad Caverns – National Park Services. History of "Carlsbad Caverns National Park"
This page was last modified on 13 January 2017, at 14:48.